On Tuesday February 27th, the residents of 31 units of rental housing faced the same threat as the residents of 300 other apartment units since Mayor Corrigan’s council passed Burnaby’s “downtown” Metrotown plan in the summer of 2017. The difference is that this rezoning, for Intracorp, the third largest donor to Corrigan’s civic party in the most recent municipal election, will be the first major development project to be located in Metrotown south of Beresford, stepped back from the skytrain line. If passed, the Intracorp rezoning will tear down six family homes on McKay and Silver Avenue and, more importantly, will destroy two low-end of market rental buildings on Maywood Street. The soon to be displaced tenants of these apartment buildings will not find any replacement housing in the new development, instead, a 32-storey luxury condominium tower will be constructed. 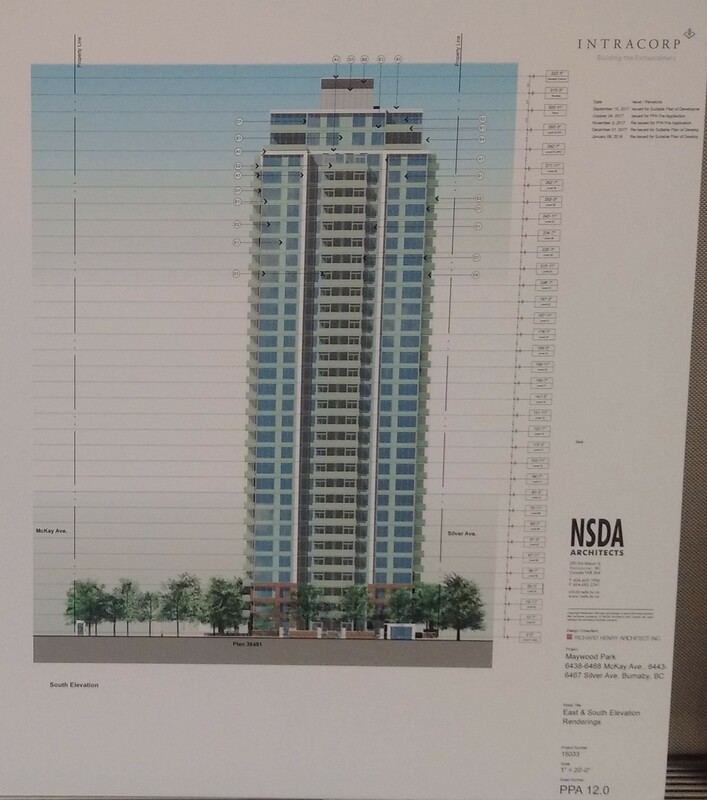 A sketch of the proposed luxury condominium. Tenants and supporters showed up at city hall to speak out against this rezoning to defend the 60 residents who will be evicted with nowhere to go if it passes. But the fight against this eviction rezoning is not a one-off event – the tenants on Maywood are on the cutting edge of a demoviction trend that is sweeping Metrotown. In the almost seven months since Mayor Corrigan’s NDP affiliated civic party passed a massive gentrification scheme to make Metrotown a “downtown” for Burnaby, over 300 units of low-end of market rental housing in the Metrotown neighbourhood have already been slated for demolition. The upwards of 700 people who will lose their homes because of this will join the close to 2000 people who have already been displaced from the neighbourhood: forced to move far many miles away if they are lucky, if they aren’t – forced into hidden or visible homelessness. The Intracorp rezoning makes explicitly clear the collusion between the development industry and Burnaby City Hall. The City is leasing the apartment land to Intracorp for a nominal amount. As a result, the city will own the apartments, not the developer, although the developer will still reap the bulk of the billions of dollars of profit from the hundreds of units to be sold for close to a million dollars a piece. What this does mean is that Intracorp will be able to completely avoid paying property taxes, because they won’t own the land, the City will and the City doesn’t pay property tax on the land it owns. This City-Corporate partnership is redesigning Metrotown around developer profits and those with enough money to buy half-million dollar condos. Tuesday, February 27th 2018: Burnaby Councillors and City Planners at Public Hearing. The Canadian Rent Report, published monthly by online rental listings site PadMapper has once again crowned Burnaby the third most expensive city to rent in Canada. The average price of a one-bedroom apartment in Burnaby is $1430, up 15% from this time last year. When was the last year that wages or income assistance increased by that much? A survey by real estate data firm Altus Group Ltd. has recently shown that Burnaby’s condo market is nearly in line with that of Toronto.Toronto is already widely recognized as city with extreme levels of polarization between the rich and poor, and it is clear that Corrigan is rapidly pushing Burnaby in the same direction. Vacancy rates in Burnaby are still less than 1%, which when combined with rapidly increasing rental prices, means that staying in Burnaby is very unlikely for tenants facing demoviction. Market forces have created this crisis, and it is market forces that are pricing people out of their community. This rezoning application states that the two rental apartments will not be demolished until 2023. This delay in demolition will mean tenants will live with targets painted on their backs, knowing their displacement is impending and inevitable. This is emotionally, mentally and physically taxing as the weight of the housing crisis falls onto the shoulders of current residents. As one tenant of 4305 Maywood put it during the public hearing: “I’ve had to go on medication because I don’t know what’s going to happen to my building.” The two apartments along Maywood may see rent price increases and negligent maintenance over the next five years. Developers like Intracorp in other parts of Metrotown have systematically raised rents and stopped spending on maintenance to maximize revenue income before they demolish rezoned buildings. While they wait for their homes to be demolished, the residents of the Intracorp buildings will see the neighbourhood around them be redesigned for a different class of people. The resulting displacement of the Intracorp rezoning will be justified by reference to the community benefit of a larger park. This park expansion is worthless to the existing tenants if we can’t afford to stay in the neighbourhood and make use of it. Replacing affordable housing with a condo tower and park expansion implies – either buy a condo, or become homeless and sleep in this park. As one dissatisfied Metrotown resident lamented, “when you make a plan, it has to have a beginning and an end and it has to work.” Corrigan’s Metrotown Downtown plan is not working for residents of Metrotown. However, Metrotown residents are fighting back by working together to create community and resistance. Perhaps the power of Public Hearings isn’t for Corrigan and Council to hear us, since they refuse to listen, but for us to hear each other. There were first time attendees young and old, and our collective anger can be organized into community power: this is how the Tenant Eviction Defense Network grows. In late 2017, Stop Demovictions Burnaby launched the Tenant Eviction Defense Network. This network is focused on building community. We envision a world where neighbours support neighbours, and people as a collective thrive and resist together. As one organizer put it, if you don’t want to leave your building when you get an unjust eviction order, I’ll be right there with you. The Stop Demovictions Burnaby Group meets every second Tuesday at the Marlborough Elementary School portable (6060 Marlborough Avenue). We also host monthly community town halls. Our next Town Hall (on the myth of Foreign Investment) will be Wednesday March 7 at the Burnaby Neighbourhood House.